Welcome to People First of Missouri! 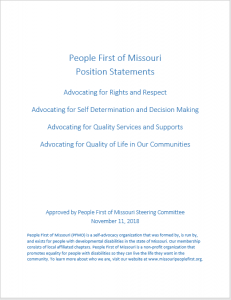 People First of Missouri is a self-advocacy organization that was formed by, is run by, and exists for people with developmental disabilities in the state of Missouri. Our membership consists of local affiliated chapters. 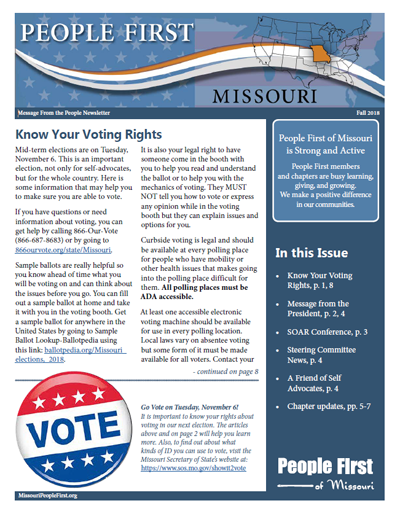 People First of Missouri is a non-profit organization that promotes equality for people with disabilities so they can live the life they want in the community. To learn more about who we are and who supports us, click here. Sign up to get future newsletters delivered to you by clicking one of the buttons below.